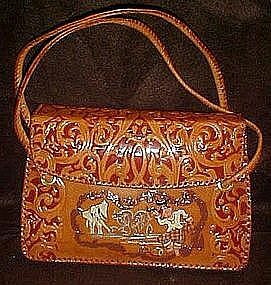 This amazing hand sewn and and crafted purse is made in Mandalay Burma (Burma is no longer Burma) I think it is now India. This has colorful scenes of an elephant and dancers on the front and back. Has a center zippered compartment. and appears to have never been used. The crazing in the leather is evident when you look closely. Purse is 8" x 12" and expandable to 4" thickness. Nice long double straps. Email me for more pictures if you like. Amazing condition!